The Australian Shepherd, or Aussie, is a very energetic dog that is known for trainability and herding. Many fitting names can be derived from this high energy nature. 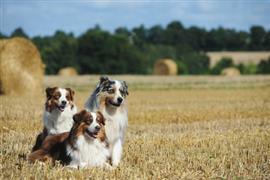 Coupled with quick learning abilities, the Australian Shepherd excels in several dog sports. It is not uncommon to find Aussies bearing names of professional athletes or local sports teams. The breed is known to exhibit a variety of coat colors that is often a good starting point when deciding on a name. Another good source of Australian Shepherd names is straight from other dogs. The breed is prevalently used as a rescue, guide, or service dog. Look through news articles and blogs for names that others have chosen. This list is comprised of the most popular Aussie names used today. Some of our pages will contain a subcategory. A subcategory is a slightly more specific grouping than the main topic of the page. For a subcategory, we will include a separated table of names and corresponding descriptions. An example of a subcategory of Red Dog Names would be 'Dog Names Inspired by Red Wines'. If you have any subcategory ideas for the Australian Shepherd Names page, we would love to hear them. Use the form below to submit your ideas.